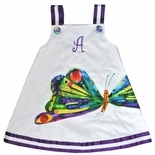 Welcome to our girl's custom made clothing section. 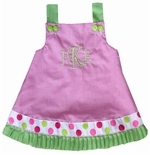 Little girls love to personalize our custom dresses and outfits to create the "it's mine" feeling! 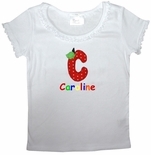 Our boutique specializes in custom personalized, designed, and created traditional as well as whimsical clothing for girls under our own brand; Caroline Bradlee. We began crafting our custom girls dresses and clothes because we believe that the innocence and sweetness of little girls should be preserved. They grow so fast, that we want them to "look like" children and not "little adults" for as long as possible. 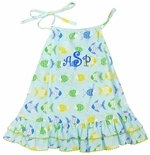 Our children's custom clothing line seeks to personalize and customize each dress and outfit for each little girl by using unique designer fabrics, appliques and monograms. We love to receive custom requests to design a dress or outfit for a little girl for a special occasion such as a birthday or portrait. We strive for perfection, and hope you agree with us that "Caroline Bradlee" reflects that quality. 2 WEEKS: Shirt only; Shirt and shorts; Shirt and pants; Bloomers. Custom Girl's Beach Toile Ribbon Tie Outfit.